Just the like the real thing! 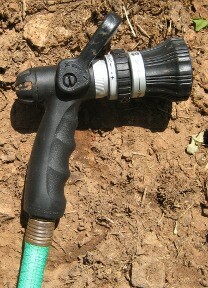 Ramblings: A firehose nozzle for a garden hose. Yes, firefighting is a serious, dangerous business. But the toys rock. Now I get to practice at home. What is your favorite barn gadget? In case anyone else was wondering why I have a garden product at the barn, they get showers. 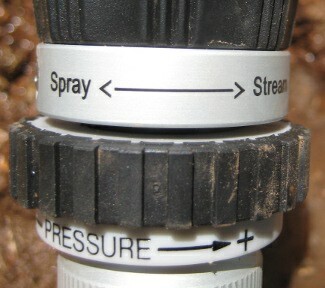 Lots and lots of showers [https://rodneyssaga.wordpress.com/2012/03/15/me-next-me-next/]. If I am not up to the minute with the bathing, Rodney flails a front foot in the trough to give himself a splash. I’m also a fan of water technology, I should see if I can find your hose nozzle here locally! My current favorite is a heavy duty rubber-edged thing I bought off Tack of the Day last year, and it goes from trickle to major blast with a quick turn. Am a fool for gadgets, especially those that don’t break. It’s washing and watering season, so I need to get with the program! Sadly, I also need to call a plumber to come figure out the freakin’ drip irrigation set up at the house. . . we moved in last year, and since I was in a cast and then a boot, I just moved around gently with a hose in my hand keeping the 50-plus roses moisturized. This year, with full mobility restored, I don’t have time to stand there like a lawn jockey, I have cement pavers to haul and a barn to build!